Recently at work we've been looking for a solution similar to that popular disk cloning utility, only affordable. That is, we needed a program that wouldn't charge us per machine cloned like the other guys do. We also needed something that supported SATA drives (and preferably SCSI drives, too). Well, after a lot of searching, I finally came across what we've been looking for: Casper XP. Works with all the versions of Windows that we use, and apparently supports any sort of drive (IDE, SCSI, SATA, USB, FireWire...) and file system (NTFS, FAT32, FAT16...) that Windows natively supports. It even runs from within Windows rather than from a bootable disk,* which is very convenient. And the 30-day trial version is actually functional, so we were able to get started with a major project right away. So far, it's been awesome. *Clarification: Casper XP SystemBuilder Edition (which is what we use) comes with a bootable CD-ROM. 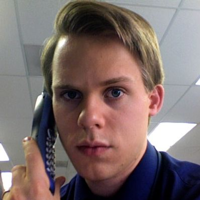 You can actually use Casper XP either from within Windows or booted from a CD. If you're not a technician and just want to use Casper XP for home use, you can get a CD-ROM ISO for an extra fee when you buy the standard edition of Casper XP. Also, on a recent edition of the MacBreak Weekly podcast I heard about a free (for personal use only) backup utility for Mac OS X: iBackup. First post in over a year! Wow, I only posted once last year. I guess it's no great surprise considering everything that's gone on in my life during that time. Since my last post, I finished my bachelor's degree, started my master's degree, became a father, started teaching a college class on Saturdays, and I recently started a new full-time job. Oh yeah, and we bought a town home. I just picked up our keys this afternoon. So, yeah, I'd say I've been just a smidge busy as of late. In fact, I'm still busy. It's just after 11:00 PM and I still need to fill out some paperwork for my Saturday job and try to post something on my university's discussion board so my teammates don't think I've forgotten about this week's group project. I'm into the TV show "LOST" (which, since we don't get ABC with our rabbit-ear antennae, I download on iTunes the day after each new episode airs). I enjoy listening to The Official LOST Podcast starring the show's executive producers, Carlton Cuse and Damon Lindelof. I converted from Palm to Windows Mobile (aka Pocket PC), largely because of the unreasonably high price of built-in Wi-Fi on Palm and because WM supports MS Remote Desktop (Terminal Services) in addition to the ubiquitous VNC. I now use my WM PDA instead of my Palm to listen to audio in the car. So far this year I've finished the New Testament, the Pearl of Great Price, the Doctrine and Covenants, a couple issues of the Ensign, the April General Conference, and I just started on the Old Testament (all of these are free downloads from here). I also listen to LOST podcasts in the car. 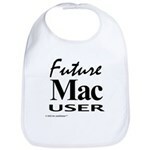 By the way, my "Future Mac User" baby gear has become my best-selling product line on CafePress. I also have a cool black version of my "VIRUS FREE (i use a Mac.)" t-shirt. Got a better design idea? Create and sell your own stuff (it's free).